Episode 10×23 “The Gyroscopic Collapse” – After Leonard, Sheldon and Wolowitz celebrate the completion of the top secret air force project, they are met with an unpleasant surprise. Also, Amy is offered a summer position as a visiting researcher. Air Date: Thursday, May 4 (8:00-8:31 PM, ET/PT) on CBS. Despite their on-again, off-again relationship in the past, Leonard and Penny have finally gotten married. Even Sheldon has found a female companion, entering into a “relationship agreement” with neurobiologist Amy Farrah Fowler, and they recently took their relationship to the next level. In their free time, Leonard and Sheldon enjoy fantasy role-playing games with their ever-expanding universe of friends, including fellow scientists Koothrappali, Wolowitz and Wolowitz’s adorable microbiologist wife, Bernadette, who is nearing the end of her maternity leave and must return to work. 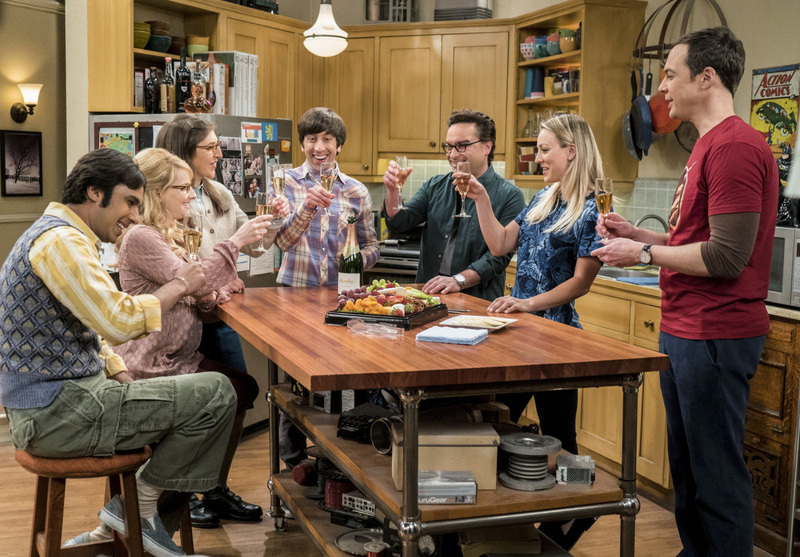 "The Gyroscopic Collapse" -- Pictured: Rajesh Koothrappali (Kunal Nayyar), Bernadette (Melissa Rauch), Amy Farrah Fowler (Mayim Bialik), Howard Wolowitz (Simon Helberg), Leonard Hofstadter (Johnny Galecki), Penny (Kaley Cuoco) and Sheldon Cooper (Jim Parsons). After Leonard, Sheldon and Wolowitz celebrate the completion of the top secret air force project, they are met with an unpleasant surprise. Also, Amy is offered a summer position as a visiting researcher, on THE BIG BANG THEORY, Thursday, May 4 (8:00-8:31 PM, ET/PT), on the CBS Television Network. Photo: Monty Brinton/CBS ÃÂ©2017 CBS Broadcasting, Inc. All Rights Reserved.